When the New England Patriots take on the Los Angeles Rams in Super Bowl LIII this Sunday, at least a handful of fans will be wearing a limited-edition, gemstone-adorned cap that might be worth thousands more than their ticket to the game. Carrying a price tag of $5,300, the New Era x Swarovski 9TWENTY hats feature an NFL shield logo embellished with genuine rubies and sapphires. Rows of rubies spell out the “NFL,” while blue sapphires provide the ground against which a stylized football and eight stars rise up in white metal. The stars represent the eight NFL divisions. 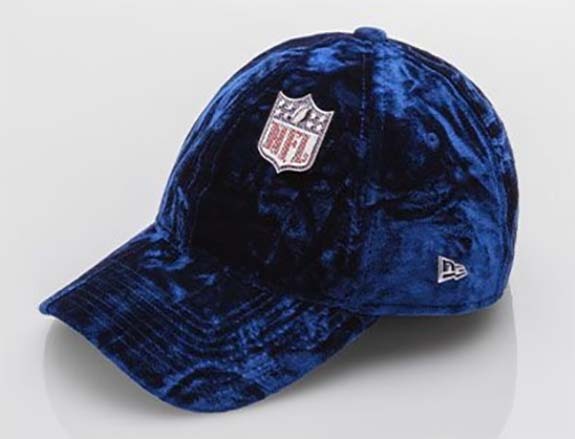 The luxurious ladies’ caps — which are covered in crushed blue velvet and lined in satin — went on sale yesterday on a first-come, first-served basis at the NFL Shop in the Super Bowl Experience in Atlanta. At $5,300, the price of one bejeweled cap is slightly less than a pair of nosebleed tickets, which are currently selling for about $2,700. The caps were designed in coordination with Swarovski, which was credited with cutting the gemstones. This was not the first time the NFL has worked with well known brands to create special items in honor of the Super Bowl. 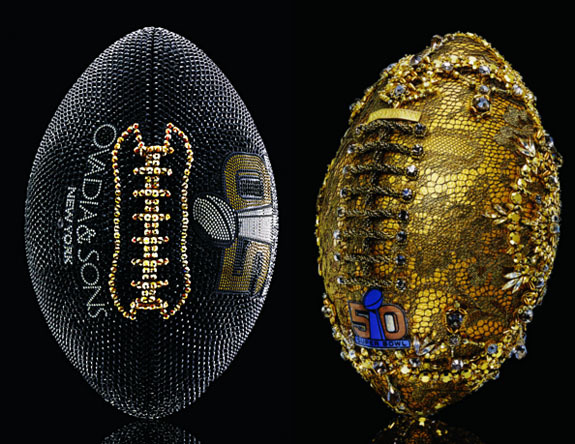 To commemorate Super Bowl 50 in 2016, the NFL and members of the Council of Fashion Designers of America (CFDA) teamed up to create 50 lavish footballs that shared a “gold” theme. 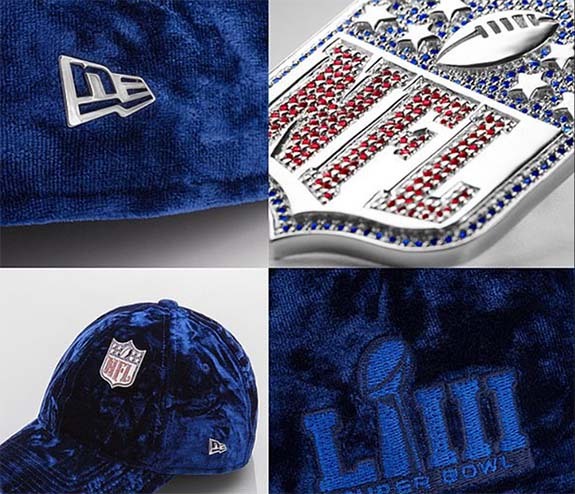 The NFL required the designers to use a “gold” theme to align with the precious metal’s traditional connection with 50th anniversaries. But, how they used the gold was totally up to them. While some positioned gold as the central motif, others used it as a glittering accent. Our favorites were the designers who took it up a notch by mixing precious metals and gemstones to make their footballs into treasures suitable for a jeweler’s showcase. Credit: Cap images courtesy of New Era. Ovadia & Sons, Marchesa footballs courtesy of CFDA.